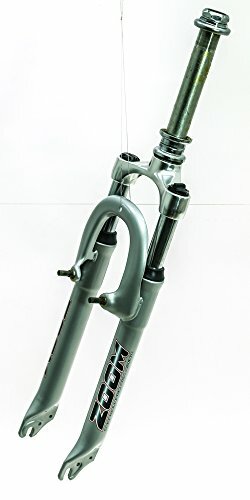 ZOOM SUSPENSION FORK NEW TAKE OFF / SHIPS IN 24HRS SPECIFICATIONS: Manufacturer: Zoom Compatible brake: Rim Brake Only, V-brake Wheel size: 24" Travel: Unknown Suspension type: Coil Steer tube: 1-1/8" steel threaded, 200mm long Axle compatibility: Quick release (9mm) x 100mm Headset fits external type compatible frame headtubes, with an internal diameter of 34.0mm Steertube length: 200mm (approximately) Condition: New take off. Please Note: The headset and fork came off of a headtube approximately 165mm in length. Compatibility with your frame is ultimately the buyer's responsibility. Spring Fork Steering Tube 22.2 8 1/2" Chrome.